Though it’s hard to believe, it’s been 25 years since audiences watched Kevin McAllister dodge escaped convicts in New York and enjoy a stay at The Plaza, one of the city’s most luxurious hotels. In honor of the 25th anniversary of “Home Alone 2: Lost in New York,” The Plaza invites guests to “live like Kevin.” Throughout the hotel, visitors can take part in a variety of experiences inspired by Kevin’s holiday trip to the Big Apple. For those who just want to pop into The Plaza, special photo opportunities are available. Souvenir photos options include a faux New York skyline with the Wet/Sticky Bandits, a scene in Central Park, and custom photo booth experiences. The Plaza’s Todd English Food Hall is offering an upscale ’90s throwback menu. Enjoy SpaghettiOs, gourmet “Todd” pockets, Charcuterie Lunchables, Funyun Rings, and Sunny-D and Zima inspired cocktails. You can view the full ’90s throwback menu here. The room package can be enhanced with extras like passes to the top of the Empire State Building or a 4-hour limousine tour of New York City. Room rates start at $895 and the package is available between December 1, 2017, and October 29, 2018. 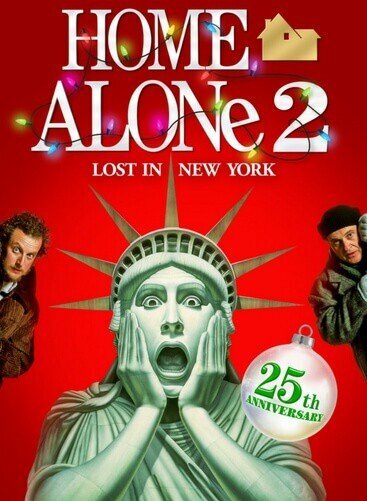 While the price of the room package is pretty steep, The Plaza is kicking off their Holiday Tree Lighting Celebration on November 27 with a chance to win a free Home Alone 2 Anniversary Room Package. Calling all “KEVVVVIN” McCallisters! Join us in The Plaza Food Hall on Monday, November 27th as we kick off our Holiday Tree Lighting Celebration with a chance to win a “Home Alone 2: 25th Anniversary Package" stay. Put on your best knit beanie, grab your knapsack and get ready to strike a pose. Learn more about how you can participate to win by visiting the link in our bio. Good luck! For more information, visit The Plaza website.